Boxing Day, the 26th of December, is the day after Christmas day. In Australia, we have 2 major sporting events which start on this day. The first is the Boxing Day Cricket Test which is played at the Melbourne Cricket Ground and the second is the Sydney to Hobart Yacht Race. In this podcast, I would like to tell you a little about the second event, an event which highlights Australians’ love for the sea and their desire to challenge themselves against it. The annual Sydney to Hobart Yacht Race is 1170km long. It starts from Sydney’s beautiful harbour on the coast of New South Wales and finishes in Hobart, in the waters of the Derwent River on the east coast of Tasmania. It is considered one of the greatest ocean yacht races in the world and really is one of the most challenging ocean races there is. What makes it so challenging is the section across Bass Strait, the area of ocean between the mainland of Australia and our island state of Tasmania. This section of the race is around 400 km long. This strait has a reputation for being unpredictable and sometimes dangerous. It has an average depth of only about 60m. This means it can occasionally produce very big waves and dangerous sea conditions. Of course it can also be very calm. I have travelled across it several times on the Spirit of Tasmania ferry and each time it has been quite calm. Even so, it can get rough, very quickly. The ferry is around 190m long, so it can handle all types of weather. But imagine being on a small yacht, say 15 metres long. This is why the Sydney to Hobart race is such a great race. The inaugural race was held in 1945 when only 9 yachts entered. The winning yacht back then took 6 days, 14 hours and 22 minutes to complete the race. In 2014, the race had 117 entries and the winning yacht took 2 days, 2 hours and 30 minutes. That’s pretty fast for a yacht. 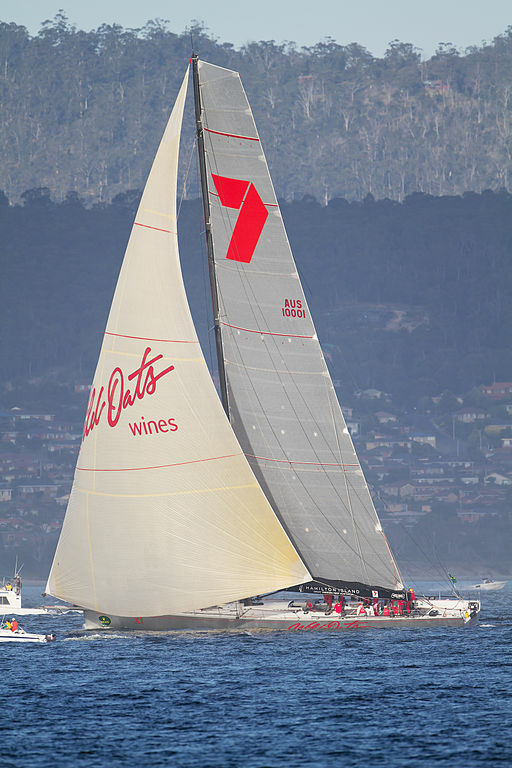 The fastest time ever was set in 2012 by the 100 foot long Wild Oats XI. It took only 1 day, 18 hours and 23 minutes. That’s an average speed of around 28 kilometres an hour – not bad for a yacht using only the power of the wind. One of the many reasons why this yacht race is so well known in Australia and around the world is because of the spectacular start. This start takes place in the very beautiful Sydney Harbour. To see over 100 yachts sailing so close together around the start line is indeed a spectacular sight. They jostle for position and they turn left and right, with often just a few feet between the boats. It’s breath taking. There are hundreds of spectator boats crowding the edge of the course, and around three hundred thousand people watching from the shores and high points around Sydney Harbour. What a sight! The biggest yachts are 100 feet long and the smallest 34 feet long, with the average size being around 58 feet. At the start of the yacht race, every skipper is trying to get his yacht just in the right position for the starter’s gun. When the starter’s gun goes off, the boats all head across the line and race for the entrance to Sydney Harbour, called the Sydney Heads. First Through the Heads, 2012 Sydney Hobart Yacht Race. Once through the Sydney Heads, the yachts turn south and start their long and challenging trip down the coast of New South Wales and into Bass Strait. The start of the race is always shown live on television, with an audience of many hundreds of thousands, and it’s something I have been watching on television for as long as I can remember on Boxing Day. 1pm is the start of the Sydney Hobart Yacht Race. The winner Investec Loyal arriving in Hobart in the 2011 race. Once the yachts have crossed the unpredictable Bass Strait, they must race down the east coast of Tasmania until they reach Tasman Island which is close to Hobart. They turn right and then race the last 70 kilometres across Storm Bay and into the Derwent River at Hobart. Just like at the start of the race, the winning yachts are joined by many spectator boats as they sail up the Derwent River to finally cross the finish line near Hobart. Waiting for them on the dock at Hobart are many cold drinks and many congratulations. What a sense of achievement it must be to complete the race. These yachts may seem big when they are all crowding each other at the start line in Sydney Harbour, but when out on the open ocean in a strong wind and rough sea, they must feel very small indeed. The race requires excellent fitness, great sailing skills, endurance and courage. Bass Strait can be very tough on both sailors and boats. The weather can change and bring with it howling winds and dangerous waves. In 1998, the race suffered its worst conditions ever. A vicious storm hit the fleet in Bass Strait, with winds up to 80 knots and waves up to 20 metres high. Of the 115 yachts that started, only 44 finished. 71 yachts retired from the race. Seven yachts were abandoned by their crews and five yachts sank. 56 crew members were rescued by helicopters and, tragically, six crew members lost their lives in Bass Strait that day. In the years following that tragedy, changes were made to how the race was managed and how competitors must prepare themselves. The yachtsmen and women are now better prepared and the race is safer, but even so, competing in and finishing a Sydney to Hobart yacht race is a magnificent feat and a wonderful achievement. That’s why it fascinates Australians and has become one of our iconic sporting events. Wild Oats XI, about to finish the 2011 race. Podcast 66 Quiz - Did you understand the podcast? True or False? – The most challenging part of the Sydney to Hobart Yacht Race is the start. True or False? – Bass Strait is always a calm part of the race. True or False? – Rob feels safe crossing Bass Strait in the Spirit of Tasmania ferry. True or False? – The fastest time for the race was set in 2012 and was 2 days, 2 hours and 30 minutes. True or False? – Rob thinks that the best part of the race for spectators is at the start. True or False? – There are lots of spectator boats at the start and at the finish. True or False? – The worst year for the race was 1998 because 6 crew members lost their lives. True or False? – Rob thinks that competing in a Sydney to Hobart Yacht Race is too dangerous. True or False? – Rob thinks that people compete in the Sydney to Hobart Yacht Race because they want to go to Tasmania. Hi, Rob. I am a Chinese student.l just knew your website by my foreign English teacher. l have listened to several apisodes.,and l think lt’s benifit to my English. Thank you. Many thanks for your message. I am very pleased that you find my podcast useful. I have not been to China yet although I plan to go there one day. Good luck with your English. I am very appreciate that you provide such great English studying material with Australian Culture,you are such considerate to all the non-english speaking people like me. Many thanks for your comment. I am really pleased that you find my podcast useful. I hope you are enjoying life in Darwin. I love these two great but very different sporting events on Boxing Day. It is a real demonstration of how much we Aussies love our sport! Yes, we love our sport for sure. Christmas barely over and off we go again. Great post and great subject Rob. Like old wine, your writing just gets better and better. Many thanks Ray for your kind comments. Cheers, Rob.